New self-build property unable to be connected to the mains. This case study relates to a new self-build property constructed in the small village of Whitecross in County Armagh. 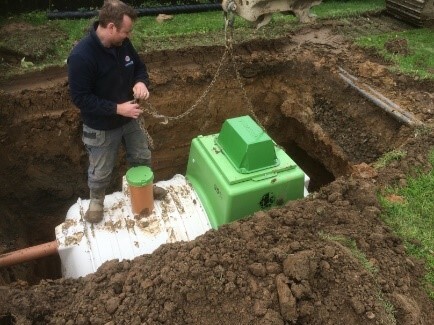 The build was unable to be connected to the mains and therefore required a new stand-alone sewage treatment plant installation. Part of the service we offer is to guide our customers through the whole process of sewage treatment plant installation, right from start to finish. This process consists of a free site visit, guidance to fill in consent to discharge application form, a run through of septic tank or sewage treatment plant recommendation and sizing, installation options and final commissioning, as well as scheduled maintenance/service plans, once your system is in place and working. In this case, our client required guidance to fill in his consent to discharge form. It is indeed a critical element of the construction process in Northern Ireland. Contact was initiated by the homeowner to Depawater, following this phone call we agreed on a date and time for a site visit. A percolation test to ascertain the (V/P) drainage effectiveness of the area, was carried out. We also filled in the consent to discharge application on the customer’s behalf. Following the site visit, we were able to recommend and quote for the best sewage treatment plant installation for the client’s the site conditions. 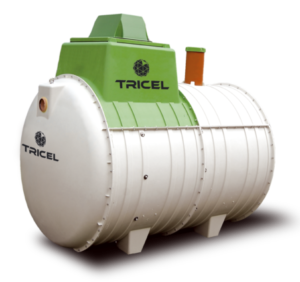 Our recommendation was a Tricel Novo UK6, gravity (no pump required) sewage treatment plant. The Tricel Novo plant is certified to EN12566-3, excellent value for money and easy to install. Eight weeks after sending the consent to discharge application, which is the standard length for application processing, the approval was obtained by our client from the Northern Ireland Environmental Association (NIEA). We were then in a position to carry out the sewage treatment plant installation to the NIEA agreed specifications. The installation started the week after receiving the approval from the NIEA. Depawater worked over two days to complete the sewage treatment plant installation, including a suitably sized soakaway (drainage-field) to meet the environment agency standards. 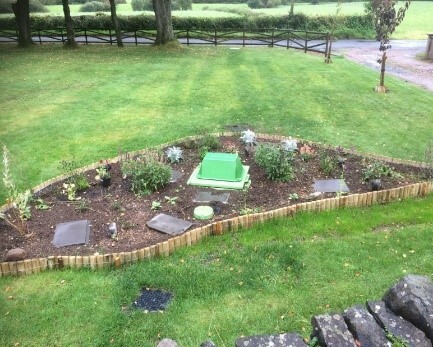 Once the tank was commissioned, the customer was able to carry on hassle-free with the rest of his self-build project in the knowledge and with confidence that he already had a reliable, effective and trustworthy Tricel sewage treatment plant in place to deal with the sewage treatment required for his new home.